Huge Savings Item! Free Shipping Included! Save 17% on the SAMSUNG-Compatible 3ACTIVE 3D Glasses. Rechargeable. by 3ACTIVE at Home Entertainment Centers Online. MPN: FBA_A1S01241GD5. Hurry! Limited time offer. Offer valid only while supplies last. 3ACTIVE 3D Glasses for Samsung Bluetooth 3D TVs Includes ONE Samsung-compatible 3D Glasses, Protective Case, Cleaning Cloth and USB Charging Cable. Includes ONE Samsung-compatible 3D Glasses, Protective Case, Cleaning Cloth and USB Charging Cable. Compatible with all Samsung Bluetooth 3D TVs. 3ACTIVE 3D Glasses are compatible with Samsung 3D TVs that use Bluetooth technology. Compatible with all JS and JU Series. Compatible with all H Series. Compatible with all F Series. Compatible with all E and ES Series. Compatible with all D Series. ****NOT COMPATIBLE with 2010 and prior Samsung 3D TVs that use infrared (IR) technology. 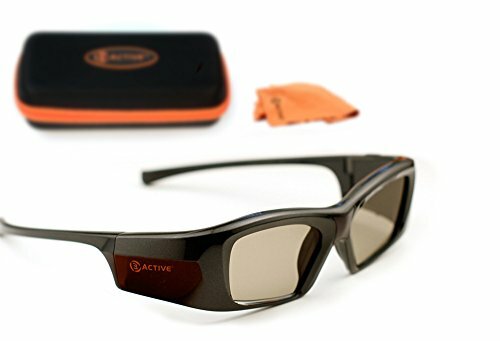 Premium 3ACTIVE 3D Glasses Compatible with 2011-2015 Samsung 3D TVs. Includes ONE Rechargeable 3D Glasses, Protective Case, Microfiber Cleaning Cloth, and USB Charging Cable. Premium LCD Glass Lenses with Scratch Resistant Coatings. Premium Nylon Frame and Temples. Plastic Hinges for Consistent Functionality. Lightweight and Comfortable. Fits Over Most Prescription Eyeglasses. If you have any questions about this product by 3ACTIVE, contact us by completing and submitting the form below. If you are looking for a specif part number, please include it with your message. ED 8 Pack CINEMA 3D GLASSES For LG 3D TVs Adult & Kids Sized Passive Circular Polarized 3D Glasses!